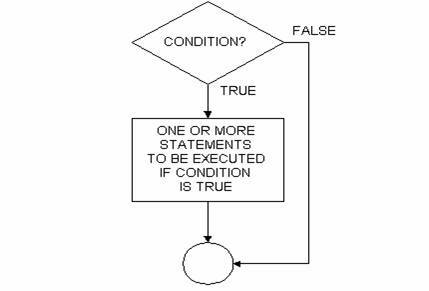 After either the true set of actions or the false set of actions are taken, program control resumes with the next statement (the statement that would be placed below the connector in the flowchart above). If the conditional expression is true, the statements between the keywords Then and Else will be executed (and the statements between the keywords Else and End If will be bypassed). If the conditional expression is false, the statements between the keywords Else and End If will be executed (and the statements between the keywords Then and Else will be bypassed). In any case, program control will resume with the statement following End If. (1) Indent the "true" actions 4 spaces from the keyword "If"
(2) Code the keyword "Else" on a separate line, aligned with the keyword "If"
(3) Code the "false" actions 4 spaces from the keyword "Else"
(4) Align the keywords "End If" with the keywords "If" and "Else"
If sngTemperature <= 32 Then Print "It's freezing!" If sngAvgGrade >= 60 Then Print "You passed!" Else Print "You failed!" Note that in the single-line format of the If statement, the keywords End If are not used. Style-wise, the block form of the If statement is preferred over the single-line form in that the block form enhances readability. A Boolean variable, which can hold the value True or False, can be used anywhere a relational expression can be used. If blnFoundIt Then . . . If blnFoundIt = True Then . . .
in other words, the "= True" part is implied. If Not blnFoundIt Then . . . If blnFoundIt = False Then . . . 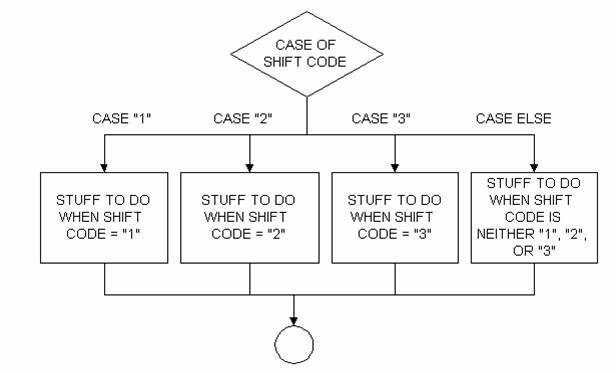 In VB, the case structure can be implemented in one of two ways: with an extended block If structure, or with the Select Case statement structure. Note that one or more ElseIf clauses are "sandwiched" between the first "If" clause and the last "Else" clause. Note also the keyword ElseIf is one word. Using the format above, this extended If structure is to be understood as follows: if "conditional expression 1" is true, perform the statements associated with that condition, then exit to the statement following the End If; if "conditional expression 1" is false, then check "conditional expression 2" - if "conditional expression 2" is true, perform the statements associated with that condition, then exit to the statement following the End If, and so on. VB will execute the statements associated with the first true conditional expression it finds and then exit to the statement following the End If. The final Else statement is often useful to trap errors that may occur when unexpected conditions arise, none of which matches the conditions in the previous If or ElseIf clauses. The example above also shows the recommended style for indenting. The format above is to be understood as follows: The Select Case statement specifies an expression to be tested. Each subsequent Case clause specifies an expression(s) that the test expression will be compared to. The first Case clause that contains an expression that matches the test expression will have its associated actions executed, then program control will branch to the statement following End Select. The final Case Else clause is often useful to trap errors that may occur when an unexpected value of the test expression is present, none of which matches the expression list specified in any of the above Case clauses.